Here is a simple solution. Strike a line down the rafters about 2 inches below the roof deck. Drive some spikes into the lines every 36 inches or so , leaving about half of the spike sticking out. Cut some blue or pink Styrofoam sheets on a table saw that are the width of the area between the rafters. Push those sheets between the rafters till they hit the nails. You will now have a 2 inch space below the roof deck; basically a small attic. Spray foam the rest of that space with some closed cell urethane insulation, and then just use wall board over it to finish the room. You MUST make sure that there is an intake for the small "attic" spaces at the soffit and also a ridge vent at the top so that the air can always be flowing. No snow will get in now, and with a peach bottom slate, the roof should last for decades to come. You will want to make sure that you have one of our professionals take a close look at the roof and fix any flashing defects or missing slates. It looks like you only have 2 x 6 rafters, and this method will do the best job of insulation and it will also strengthen the whole structure. Good luck with the project, and post some finished pictures if you will. When I googled "blown in snow" with slate roofs I kept getting references to old slate roofs with lime mortar placed on the underside of the roof (torching)to stop such a thing. All of the references were from UK websites, none in the US. Is snow infiltration not a common problem? Do you think there's a ventilation problem because of the plastered side walls? This was my grandparents house and my mom says she always remembers the snow filtering in. Nothing has been changed in the attic since it was built. The house has zero HVAC, so I already assumed anything I do in the house will change A LOT, But I truly don't want to cause future issues by making a bone-head mistake. My tentative plan for the attic was to remove the plaster on the sides and possibly recover once its insulated. place some type of rigid insulation or a baffle & rolled insulation between the rafters with at least 1-2" air space under the roof- creating an "A" with soffit and ridge vents to allow air flow. Then a simple finish over that with wood boards, which could be removed and replaced easily if we suspected a leak in the roof. Does that sound like a disaster in the making? I truly appreciate the input. I have no idea what you are talking about when you say "torching used on old roofs in Eurpose" I will say that you are going to be changing the whole dynamic of the house if you try and insulate and cover everything on the inside. It looks like a ventilation problem more than anything else, as you have negative pressure blowing the snow into the attic. With proper ventilation, the air moves in at the lower levels and exits at the peak or gable ends. The movement is out and not in. If you think you have problems now, wait til you do what you are thinking about and it will get worse. Just saying! good luck with that. We get fine snow filtering in throughout the whole attic. 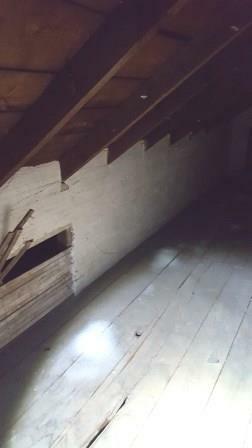 It's not coming from one specific spot and we would like to turn the attic into liveable space. The price we got for pulling off all the slate and adding felt is prohibitive. I'm wondering what else can I do to stop the fine snow? I've read a lot about torching used on old roofs in Eurpose, but our roof was not originally built that way. I want to insulate between the rafters and don't like the idea of snow blowing in and melting inside.